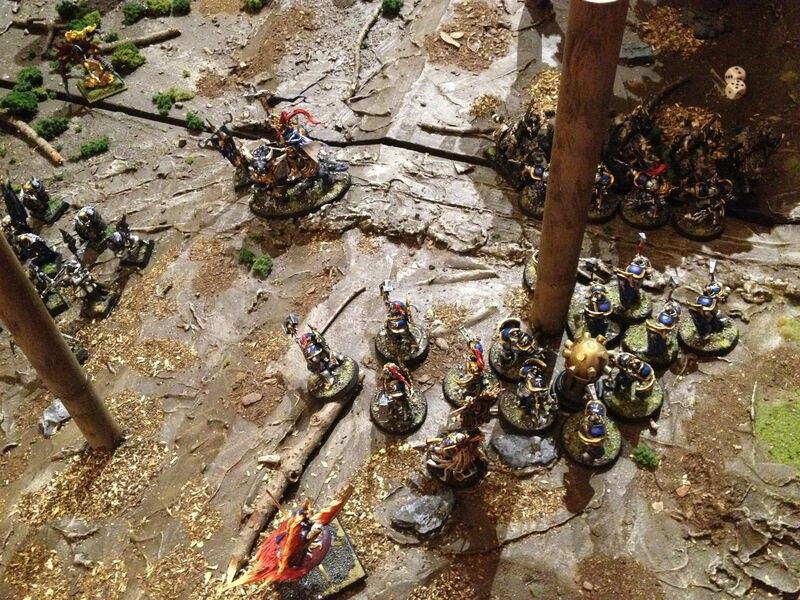 After his defeat in Chamon, Lord Dal Amarth just barely escaped the forces of Sigmar (see TMP link and TMP link On his way through the hastily summoned warp portal he was struck in the back by shockbow bolt, tearing a hole straight through his mortal form. 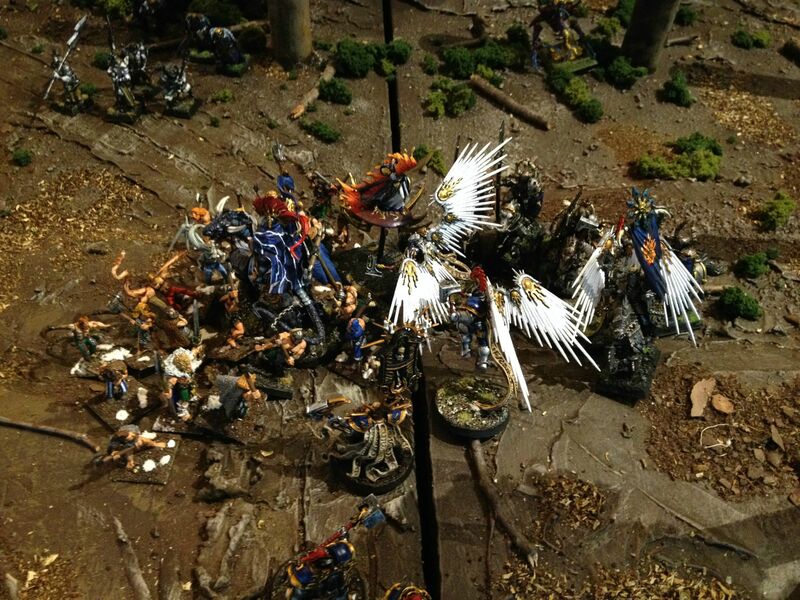 The fires of Tzeentch leaked out and he knew his time was short. He would have his revenge on the Sigmarites before he died. Escaping to the realm of Ghyran, he summoned his best commander, Tseekyuskang, to him. 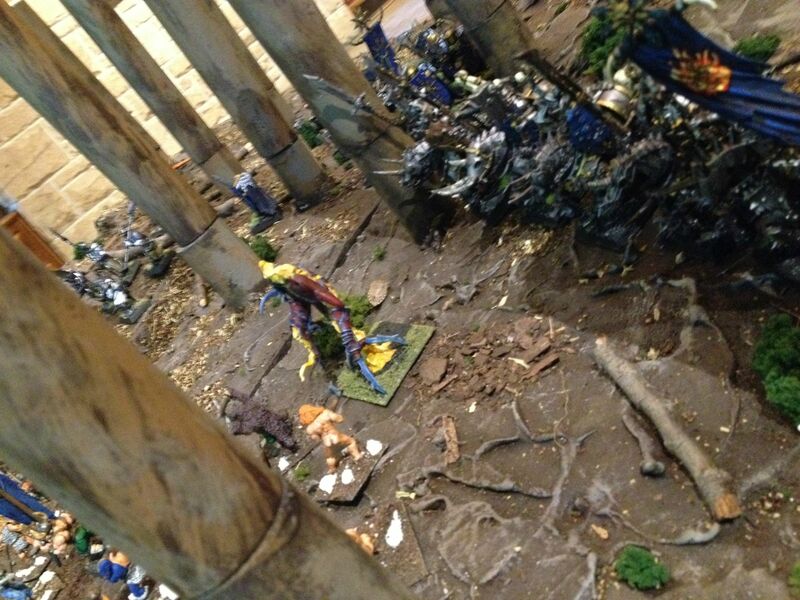 Nurgles assault on the Realm of Life had stalled. 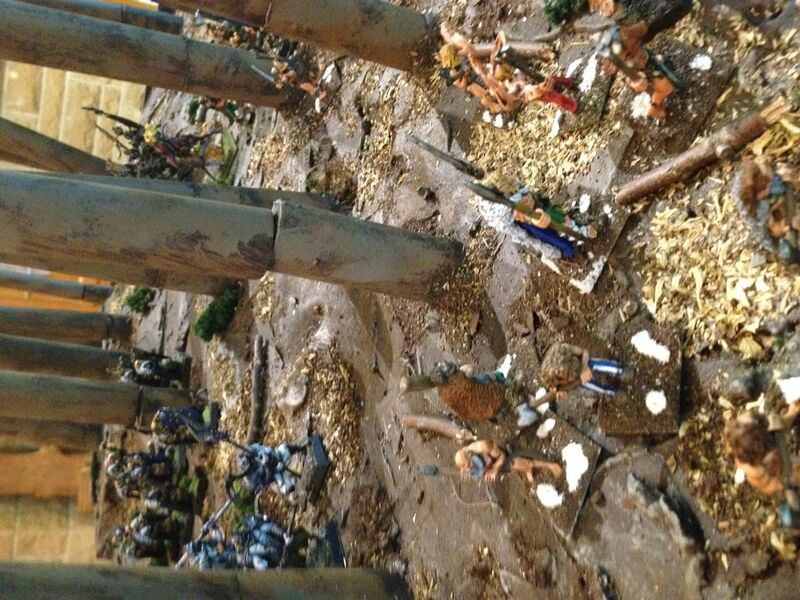 Sigmarite reinforcements poured in to drive back the progress the Lord of Decay had made. 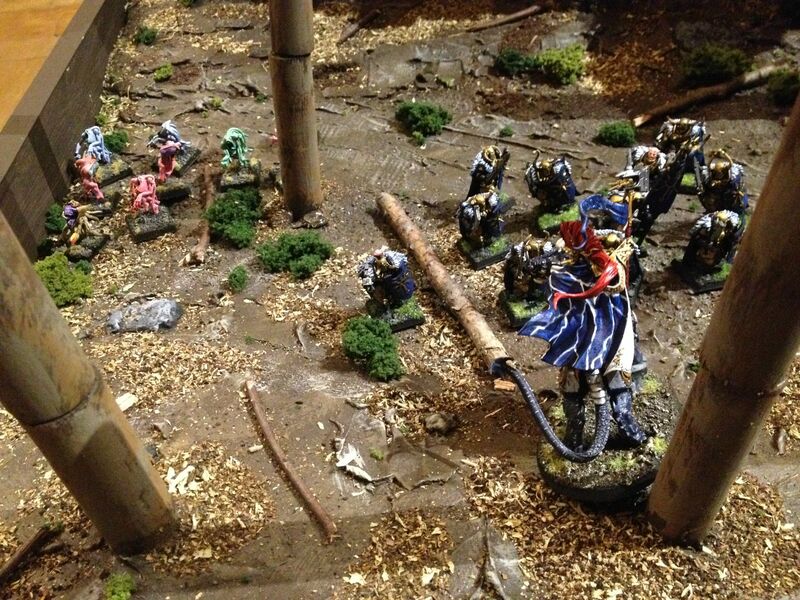 The skeins of magic revealed to Amrath the presence of a force of Sigmarite Warriors transporting a parva portam propius to seal off one of the Skaven pits. This force would die at his hands. His form was already being consumed by the flames and he stood dripping burning ichor as he moved through the forest, his form a beacon for the enemy to detect him as much as a rallying point for his own forces. 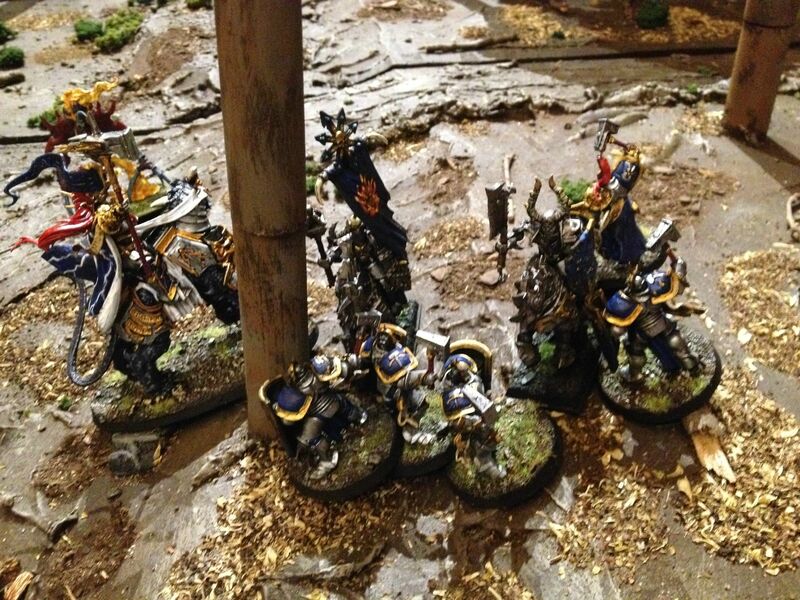 With a nod he sent his knights moving towards the enemy. 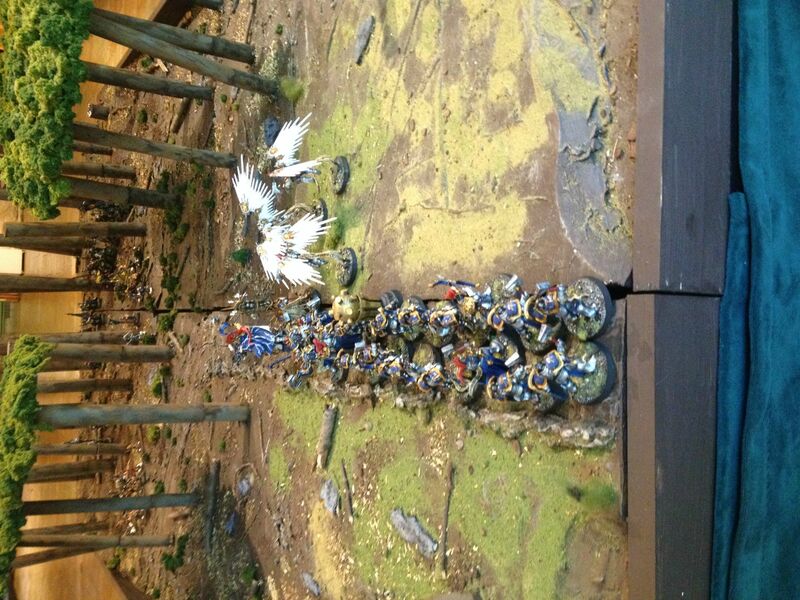 Flying ahead of the main army down the road the Prosecutors are the first to see Amrath's forces. 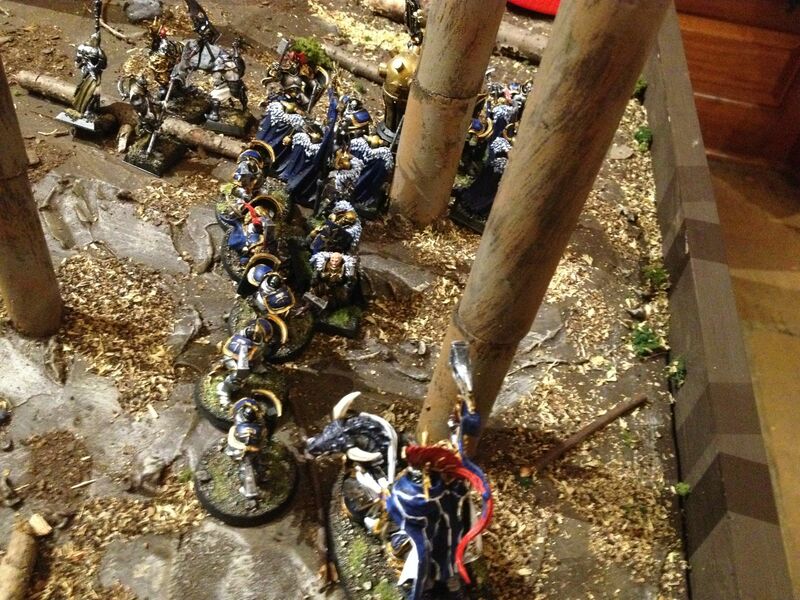 Quickly the Lord Cellestant races up to support them as they are ambushed by the enemy. 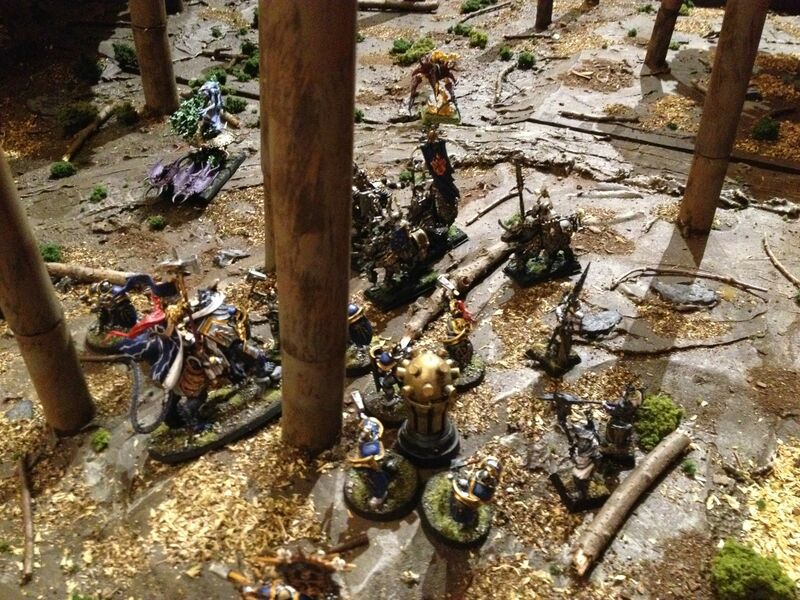 Amrath watches as the Cellestant smashes his way through a number of the marauders while Lord Tseekyuskang and the Chaos knights fling prosecutors to the ground in a bloody pile. The last prosecutor swings out of the fight and leads the Liberators with their invaluable prize towards their destination. ("Follow me, the road lies this way!" Pursuing the fleeing enemy Lord Tseekyuskang scythes the Prosecutor Prime from the air, a great burning hole in the side of the Sigmarite eventually consumes the whole body in sickening warp fire. 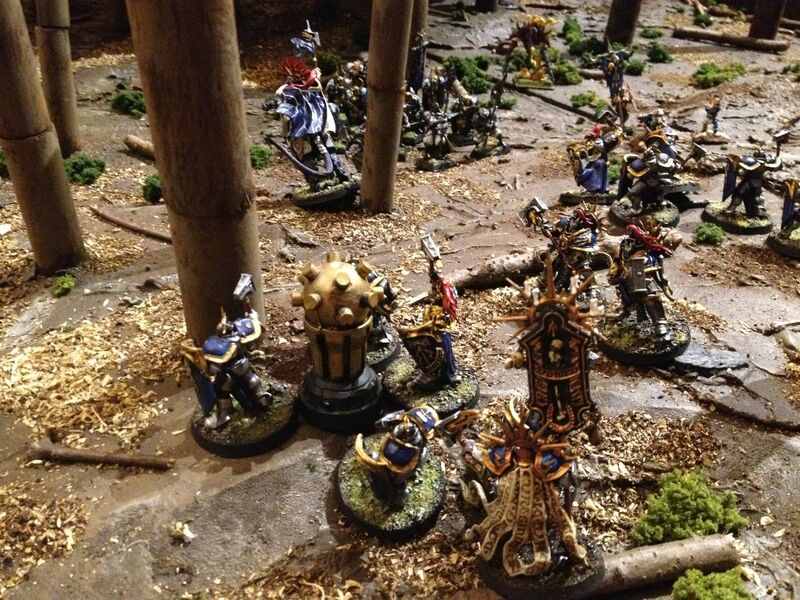 The Knights charge into the Judicars who have formed up on the road to screen the movement of the Liberators. Almarth screams in frustration as yet another attempt to summon allies is thwarted. It seems as though the trees themselves were attempting to interrupt his plans. The Liberators by pass the road and with Liberators and Judicators screening them from the rear and Retributors watching their flank they continue to move towards their destination. Almarth raises his hands above his head and screams out and incantation of summoning, while the woods absorb some of the power of the spell it is not enough and the words echo among the trees until the start coming back to the sorcerer and the air shimmers with the sonic vibrations and coalesces into a solid form. 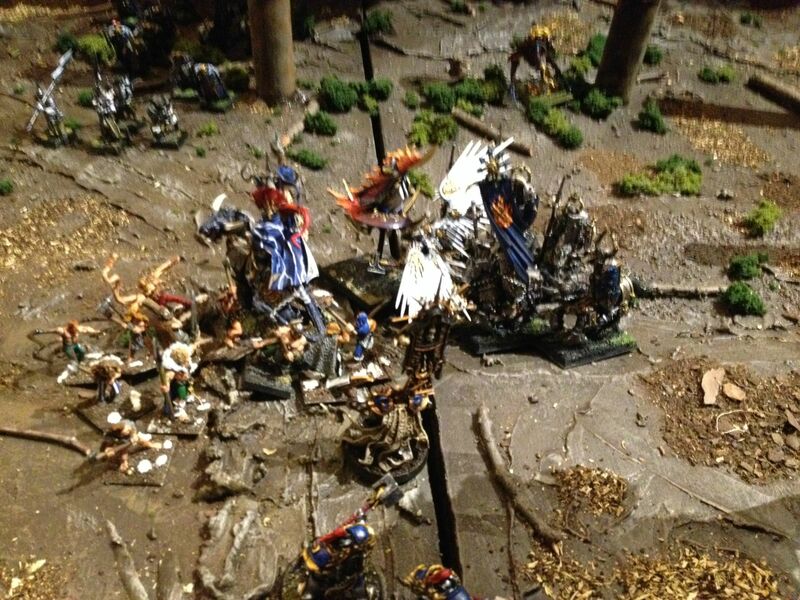 The sorcerer grabs the form from the air and hurls it into the path of the Liberators. It splashes into a pool over the forest floor and quickly a gibbering begins as the pool forms itself into 9 Pink Horrors in the path of the Sigmarites. 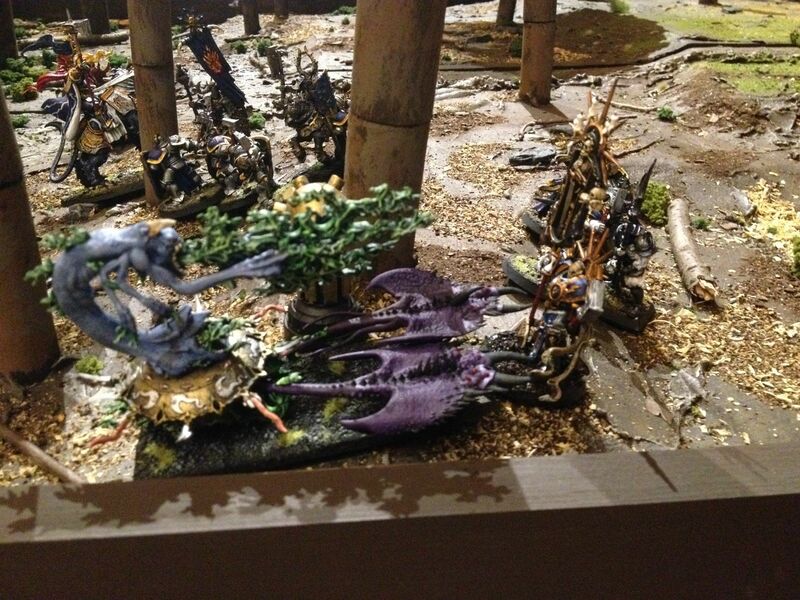 Meanwhile the mortal warriors of Chaos begin their assault on the Sigmarite forces. 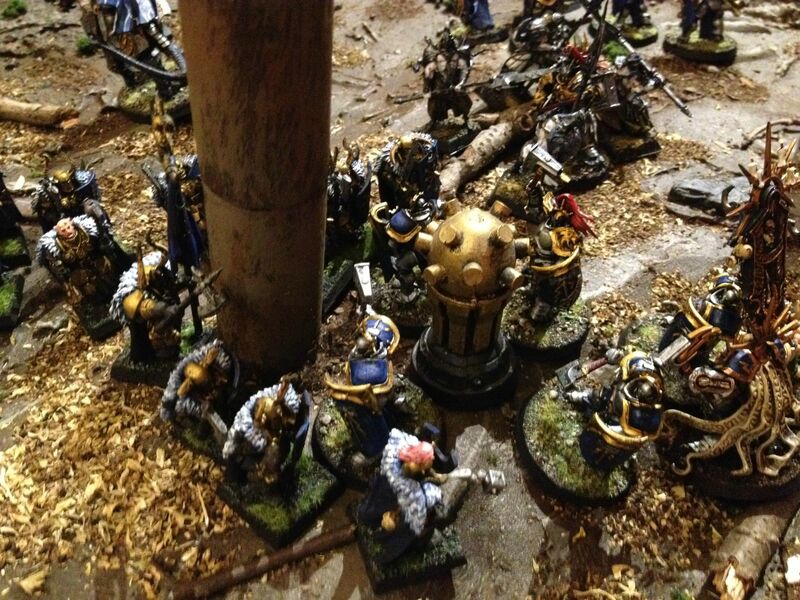 The Lord Cellestant orders his remaining Liberators into the line of Warriors as he himself plunges among them too inflicting horrible carnage with his Tempestos Hammer. Amrath feels his life force pouring out of him, his body finally being almost completely consumed by the flames of Tzeentch, his last sight is the burning chariot driving back the Sigmarites from the parva portium propius. 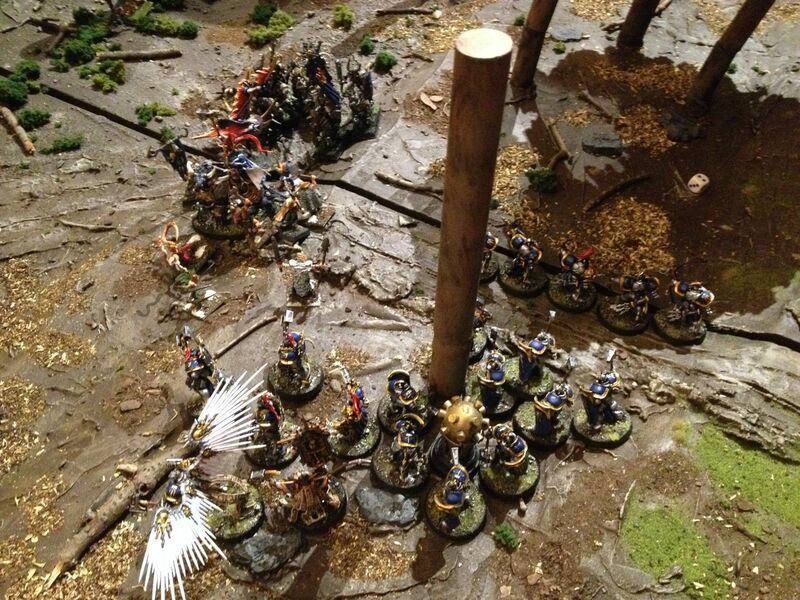 In this scenario the Sigmarite forces had to move an object to an exit point about 2/3 of the way down the table. They needed at least 3 models to move the object. Those models could still run but had to drop it to charge. There was a road that went down the center of the board the road curves and ends at the Sigmarite exit point. The woods were actively struggling against the forces of Chaos and any attempt to cast a spell could be unbound by the woods themselves. I if ever try these rules, please know that it will be because of you. You definitely approach the game like the designers intended it to be played. good job on these reports! Thank you very much. That is high praise indeed. I'm glad you like them. I don't know when I will get my next game in, possibly Friday night. 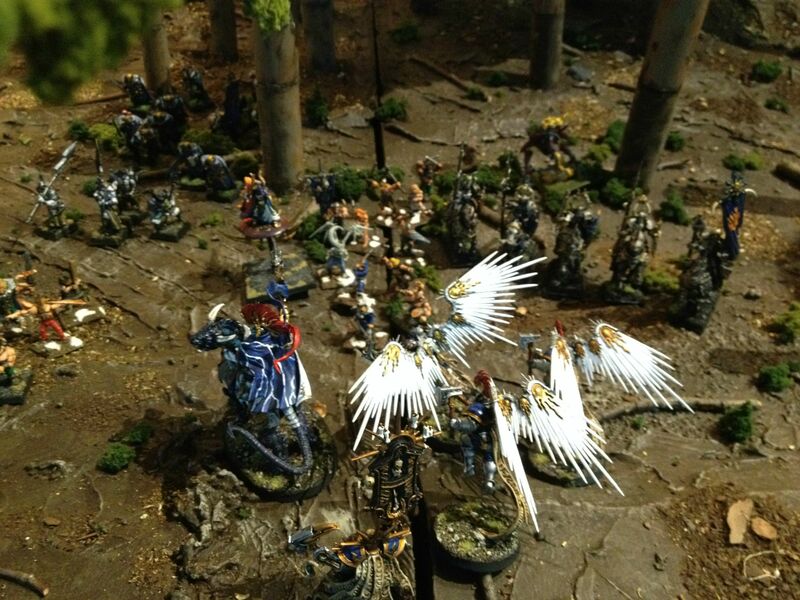 When I do I'll be sure to take some pictures and post another battle report.